Winner from Barbados selected from over 2 million entrants! The jury consisted of Jan McAlpine, director of the UN Forum on Forests Secretariat; Jean-Paul Paddack, director of the network initiatives support unit; Daniel Shaw, head of communication at the International Union for the Conservation of Nature (IUCN), and Jean-François Thivet, philately expert at the UPU International Bureau. Charlée Gittens’ letter is displayed at the end of this story, so just scroll down when you want to read it. Kiss your Graeme Hall National Park goodbye. "Protected" area in red now approved for development by friends of Government. 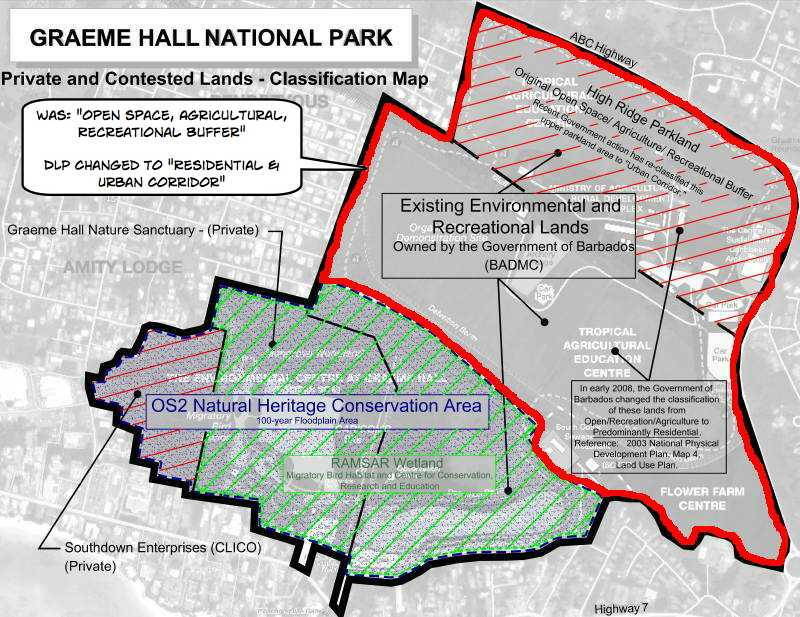 The people of Barbados were betrayed by their political leaders when in January 2008 our Parliament voted to remove the legal protection against development for vast areas of the Graeme Hall Wetlands. The area had previously been set aside for a National Park but the politicians knew they could sell the land to their developer friends or relatives for cheap and make oodles of filthy money. So they changed the law to allow them to develop the last major green space between the airport and the city. That’s what they want to do and they have the power so they are doing it. No more Graeme Hall National Park. While they are at it, they are killing the last major Mangrove Forest on the island because they want to build a condo city and make even more money. It is a little known fact that most of the travel brochures and hotel websites show 15 year old photos of our West “Platinum” Coast beaches because if they showed folks what the Barbados West Coast really looks like today nobody would book the hotel. For the elites with money there is a solution though: make a “political donation” and the government will allow your property to build groynes into the sea to capture the sand for your hotel’s beach. Of course it destroys other people’s beaches – but they don’t give money to the politicians so that’s okay! 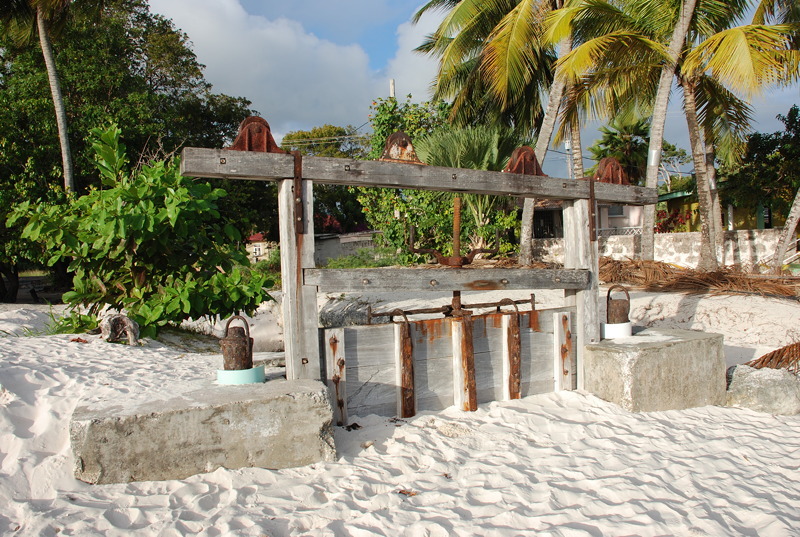 Mexico put a stop to destructive groynes. Barbados should do the same. And don’t forget as a bare legal minimum to put a narrow little path from the road down to the beach so citizens can access the beach. The secret to keeping out ordinary folks from enjoying the beaches is to provide no parking and no pedestrian bridges to cross the dangerous highway. That keeps those filthy Bajans away from the nice West Coast beaches so the high-end tourists don’t have to worry about the noise from happy Bajan children and families enjoying their own country. Politicians’ words mean nothing: their actions speak the truth. The BLP and DLP governments did all that to us and more. Remember that folks, next time you hear some fat politician talking about “the environment” or “sustainable development”. Although this letter is addressed to Barakat Timbers, I am writing to anyone who is willing to listen. You humans constantly rave about your World Wars and civil unrests, but what of ours? From the beginning we have been murdered, but we were not greatly angered for we understood your necessity. Now you don’t just take what you need, but damage our habitats to such an extent that we shall never again thrive in the same location. You heartless beasts who claim superiority yet cannot live in peace as we do? I am a Great Oak in the Windsor Forest of Guyana and I say stop! Not even for my species’ sake, but for yours. Do you not see how integral we are for the survival of your kind? Global Warming is a ubiquitous crisis of this era which stems from several causes. The burning of fossil fuels which produce greenhouse gases, which are by definition gases that trap heat in the atmosphere, has been one of the greatest detrimental factors of global warming. The gases cause an increase in Earth’s temperature, damaging the ozone which is the most important layer of atmosphere involved in the protection of life on Earth. It shields you from the true brunt of the sun’s rays, absorbing a colossal 97-99% of harmful ultraviolet rays. Greenhouse gases are emitted as a by-product of burning fossil fuels such as coal and crude oil. To ignore this situation is to leave you vulnerable. Other than with the few exceptions of phytoplankton and chemosynthetic organisms, plants are situated in the first thropic level of all food chains. All energy is obtained from the sun by humans indirectly and the only way to gain some of that energy other than from the miniscule part played by the other autotrophic organisms is from plants. Why? Plants use sunlight energy, water and carbon dioxide gas to create energy to sustain ourselves and to grow and develop. Humans cannot obtain energy in this way and neither can any other mammals; therefore you gain this energy indirectly by eating plants whether by eating the plant itself or an animal somewhere in the food chain through which the energy flows. To leave us vulnerable or to decimate us is suicidal. Erosion is becoming a major concern on Earth. Frequent mudslides and avalanches destroying towns, taking lives and no-one would believe if I told them the answer. Go simply au natural. When walking past a Great Oak such as I you usually marvel at my height and circumference. Rarely does someone think of what is growing below my torso. I too have legs, though I prefer not to walk. Call it laziness; I see it as an investment in prime real estate. Working along with other materials, roots play a big part in keeping soil compact. When speaking of soil humans are very ignorant of its layers. As topsoil is removed, subsoil is exposed and erosion occurs. Subsoil does not easily support agriculture, flooding occurs more readily and in short, life on Earth increases in hardship. Once again I offer you a simple solution. Let nature do her job. Many who read this will not take heed. But a word to the wise is enough, so for anyone who should be interested I may offer some suggestions to aid in the continuation of your species. Take a look at Beijing, China. Look at the fog that surrounds the city and realize that you are on the same path. You may not see it now, a bit like getting taller. You don’t realize it has happened unless you measure your height constantly or until there is such a difference that it is impossible not to have recognized it. Will you only stop when it is too late? Reduce the use of products made in factories that produce greenhouse gases. Don’t drive a half-mile to the supermarket for a box of milk. Take a nice walk through the refreshing air we recycle and provide for you. It’s therapeutic and healthy. Use reusable plastics. Plant more trees around your homes. In this age of technology use your electronics and less paper. But there will be those who will pay me no mind and I say to you in the words of Gerard Manley Hopkins ‘And for all this nature is never spent’. The sun will continue to rise in the East and set in the West, but should you continue on this hell-bent path you will cease to be. As you take this suicidal walk take note that I will never be conquered and shall rise as you fall. Read about the UN Contest and next year’s contest here.